Hey everyone, Kali here again! For the past six and a half years I have struggled with chronic pain. I had a few surgeries when I was 19 and was left with some pretty bad chronic pain in my head, neck and back area. Chronic pain typically goes hand in hand with mental health problems such as depression and anxiety and I experienced that for a long time. Over the years I ignored the doctors who told me that losing weight could help. I had legitimate reasons for this pain, why would my weight make any difference? I treated my pain with medication and physical therapy but found little relief. At times, the pain got so bad that going to the hospital was my only option. My baseline pain level was typically at about a 5/10 on the pain scale and would get as bad as 9/10 during flare ups. When I first started losing weight about a year and a half ago, I didn’t notice any difference with my pain levels. I continued to think that what the doctors me wasn’t true, and that my pain was not at all related to my weight. Today, I am happy to admit that I was wrong. After losing over 70lbs, I am in the least pain that I have been in since my chronic pain started. Don’t get me wrong, I still have chronic pain, but now it is much more manageable. My daily pain baseline now is about 2/10, and even during my worst flare ups, the pain doesn’t go over 8/10. I haven’t gone to the hospital for pain for more than 2 years now. With my chronic pain improving so much, my depression and anxiety have improved immensely as well. 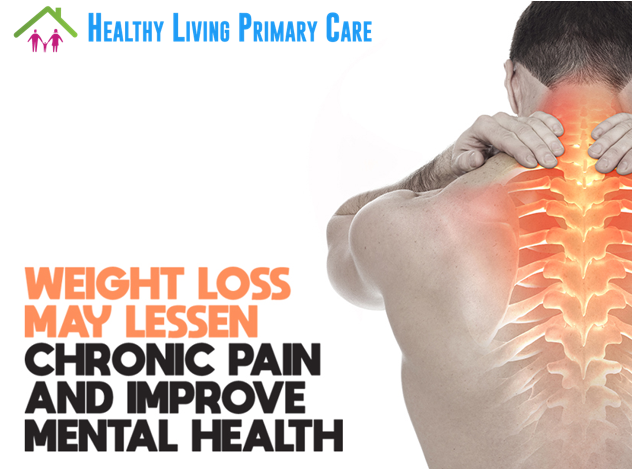 Losing weight is not a cure-all for chronic pain and mental health issues, however if you have struggled with weight on top of chronic pain, losing weight can significantly improve your pain levels, and improve your quality of life overall.